Xiaomi placed it’s full focus in Indian Market, due to its success of Xiaomi Mi3 and it is planning to release line of devices into market soon. 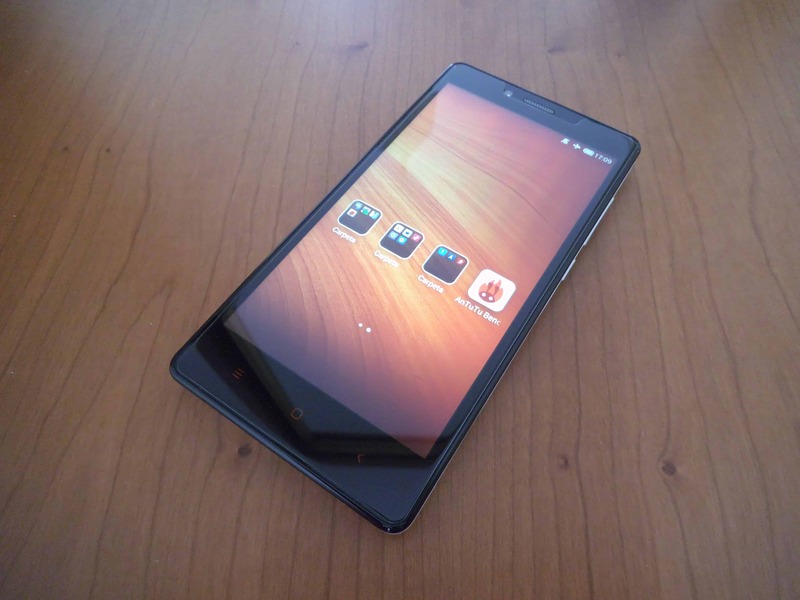 After our review on Xiaomi Redmi1s, the other Xiaomi Smartphone, “Xiaomi Redmi Note”, that is releasing in India soon this September through Flipkart again. Redmi Note supports a 5.5-inch IPS display with a resolution of 1280 x 720 pixels. The panel is based on the OGS technology and offer 178-degree wide viewing angles. The phablet is powered by an octa-core MediaTek MT6592 processor clocked at either standard version 1.4 GHz or enhanced version 1.7 GHz. The standard version 1.4 GHz variant will feature 1GB RAM 8GB ROM, while the enhanced version 1.7 GHz version will house 2GB RAM 8GB ROM. Display : LCD IPS OGS 5.5 inch HD resolution of 1280 x 720 pixels (312 dpi). Also the screen is protected by the panel Corning Gorilla Glass 2 . Chipset : MediaTek MTK6592 , SoC consisting of an eight-core processor Cortex-A7 at 1.70 GHz and the graphics ARM Mali-450 MP4. RAM : 2 GB of RAM . Internal Storage : 8 GB of internal storage expandable via microSD up to 32 GB additional. Cameras : Rear camera 13 MP f / 2.2 with LED flash , front camera of 5 MP . Both cameras are capable of recordingvideo in Full HD quality . Autonomy : makes use of a battery of 3100 mAh that standard use (depends a lot on your use of the user) usually exceed two days of life . Connectivity : GSM (900/1800/1900 MHz), WCDMA (900/2100 MHz) Dual SIM (dual stand-by), Wi-Fi 802.11 b / g / n, Bluetooth 4.0 (A2DP, LE), USB On the-go ( OTG ), FM Radio, GPS, A-GPS. 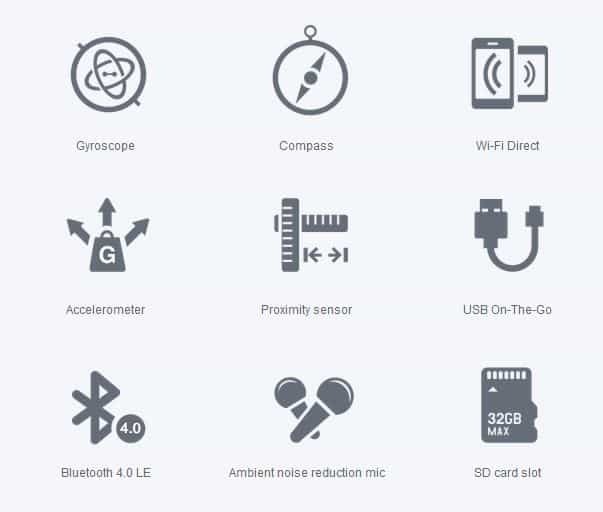 Sensors : gyroscope, light sensor, accelerometer, proximity sensor and compass. Dimensions and weight : 154 x 78.7 x 9.45 millimeters thick. Weight: 199 grams. OS : MIUI v5 (based on Android 4.2.2 Jelly Bean). MTK 8-core processor available at 1.7GHz, 78% higher processing performance than Quad-core MT6589T. Cortex-A7 architecture individually allocates tasks to each core, reducing power usage and heat. Games, webpages, and apps, look stunning and run smoothly. 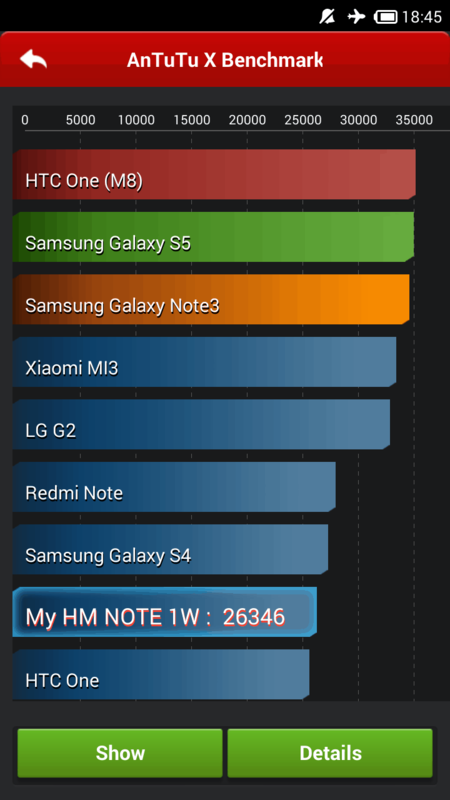 See the Benchmark of Redmi Note. 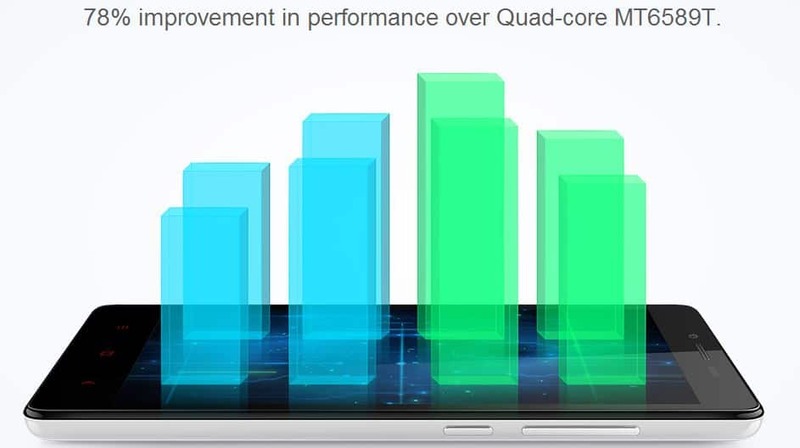 Up to 1.4x better graphics performance than the Mali-400. See rich textures and subtle shading as you explore immersive game environments. Stunning 5.5” HD IPS display.Go big with the screen. Games, ebooks, and videos, are vibrant, clear, and bigger than ever. 178° in-plane switching (IPS) technology delivers stunning color consistency from almost any angle. With Glass-film-film (GFF) architecture, pixels sit closer to the glass, which allows colors to pop off the screen. Images are not only brighter, but are also less affected by glare. A 28 millimeter wide-angle lens lets you capture more with each shot. More scenery, more friends, more of the moments that matter to you.Redmi’s ƒ/2.2 aperture and 28mm wide angle lens let you focus in on objects in the foreground of your shot, while softly blurring objects in the background. A rear housing is sometimes impossible to extract. A screen with colors too warm and sometimes unrealistic. A rear speaker very weak when compared with that of Xiaomi Redmi Note. And as in the above review, and mistranslation MIUI accompanied with their binging to RAM. If I had to rate from 0 to 10 to Xiaomi Redmi Note (taking into account the range in which we are moving), would give a 9 out of 10.